This is my temple! I go here almost every week and see it every day, as it is in my neighborhood. Temple Facts from Ldschurchtemples.com: The Oquirrh Mountain Utah Temple was the thirteenth temple built in Utah and the fourth built in the Salt Lake Valley, following the Salt Lake Temple (1893), the Jordan River Utah Temple (1981), and the Draper Utah Temple (2009). The Oquirrh Mountain Utah Temple and the Jordan River Utah Temple are the only two temples in the world located in the same city (and in the same zip code). The spire of the Oquirrh Mountain Utah Temple was installed atop the temple on July 11, 2008, immediately followed by installation of a gold-leafed statue of the angel Moroni. Lightning struck the angel Moroni statue atop the Oquirrh Mountain Utah Temple on Saturday afternoon, June 13, 2009, during the public open house. The powerful bolt of lightning blackened Moroni's trumpet, arm, and face. A replacement statue was installed on August 11, 2009, 10 days before the dedicatory services began. President Thomas S. Monson dedicated the Oquirrh Mountain Utah Temple on his 82nd birthday. The crowd gathered for the cornerstone ceremony spontaneously sang him a birthday song. 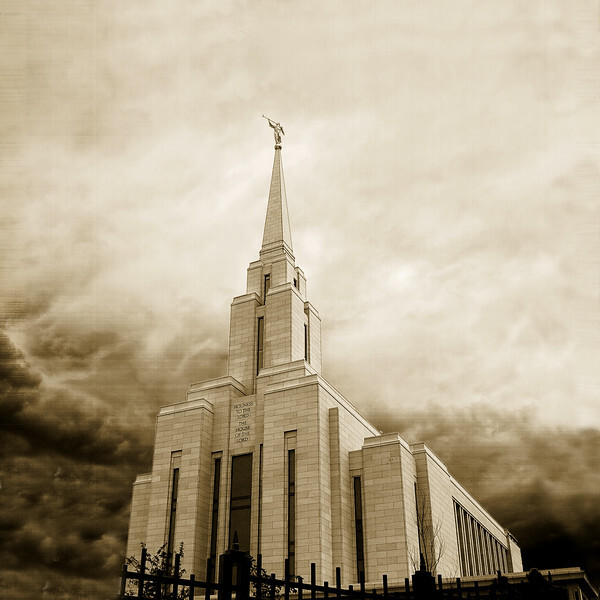 For the first time in Utah's history, church was cancelled statewide on August 23, 2009, to allow members to attend the dedication of the Oquirrh Mountain Utah Temple without conflict.